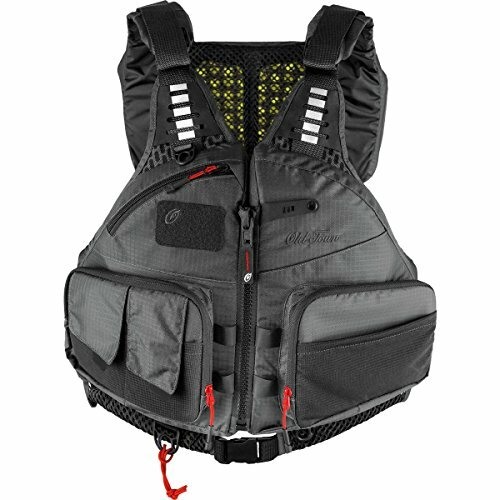 Old Town's Lure Angler Men's Life Jacket is designed with the performance kayak angler in mind. Made from tough rip stop nylon, the Lure Angler features adjustable shoulder, waist, and side straps, plus a high-back construction that nests comfortably with tall kayak seats. Designed to carry a lot of gear, the Lure Angler features zippered pockets for secure tackle storage, stretch mesh pockets for tippets and spools, an envelope pocket for holding a VHF/GPS, plus Hyperon tab and D-ring attachment points. The Lure Angler's Air Comfort System provides unmatched breathability, keeping you cool on the hottest days. This life jacket fits a men's 40-inch to 46-inch chest and is USCG Type III and ULC certified. Old Town is the world's oldest and largest manufacturer of canoes and kayaks. The company has spent over a century innovating—boat after boat, all while staying true to their Northeast heritage and a long legacy of quality craftsmanship.